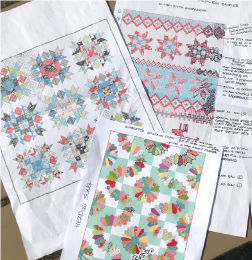 Learn how Amanda plans her quilting designs so that they both enhance the piecing and enable a square and smooth ﬁnish. Quilting affords the opportunity to add another layer of design and you don't have to be an expert to get spectacular results! We work with pen and paper in the ﬁrst half of class, designing on top of piecing handouts that Amanda provides. During the second half of the class we practice the rulerwork or free-motion that helps us achieve great results! This class is going to be full of great info you'll want to bring pen/paper for note taking, a ruler (just for straight edge line drawing) and scratch sheets of paper. ASC will supply the color handout. Amanda Murphy will supply the inspiration!